Arthrocentesis is the aspiration of synovial fluid from a joint space for diagnostic evaluation. The technique is simple to perform for most peripheral appendicular joints in small animals and is associated with minimal morbidity. When combined with other diagnostic procedures, such as radiography, evaluation of a synovial fluid sample can assist in the diagnosis of joint disease, and an animal’s response to treatment. Synovial fluid analysis should be included in the diagnostic evaluation of patients with single or multiple joint effusion, fever of unknown origin, generalized stiffness, or shifting limb lameness. The procedure is safe and simple and requires little time, and supplies are often inexpensive. Initial diagnostic testing that should be considered before joint taps are done include a CBC, chemistry profile, urinalysis/ urine culture, and radiographs of affected and corresponding nonaffected joints. A coagulation panel can be submitted if hemarthrosis secondary to toxicity or inherited disease is suspected. 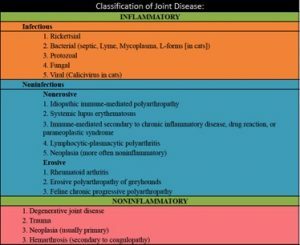 Further studies, such as serologic testing for infectious agents (Borrelia, Ehrlichia, Rickettsia, and Toxoplasma species) and systemic testing for immune-mediated disease (such as antinuclear antibody or a urine protein–creatinine ratio), should also be considered when appropriate historical or clinical signs are present or after joint tap results have been evaluated. Blood cultures may also be considered to look for a systemic infectious cause of joint inflammation. · EDTA and plain vials. The use of blood culture bottles should be considered, particular in cases where a slow or scarce growth of bacteria is suspected (e.g. with previous antibiotic therapy, with slow growing bacteria). The animal should be restrained appropriately before the procedure. This may be achieved by sedation, a short general anesthetic or, at least, a local anesthetic (under the skin, not into the joint). The animal should lie comfortably in the appropriate position and the limb from which the joint fluid is to be obtained should not move during the procedure once the proper limb position is achieved. The arthrocentesis site should be clipped and prepared aseptically with a chlorhexidine or povidone-iodine preparation and alcohol. It is important to note that, depending on size of the respective animal and chosen joint, a yield of less than 1 ml joint fluid is common in non-effused joints. With the shoulder in a neutral position (neither flexed nor extended), palpate the acromion and introduce the needle perpendicular to the skin directly below the acromion. If the needle hits bone, gently ‘walk’ the needle either slightly proximally or distally until the joint capsule is penetrated. crest of the humerus and the anconeal process of the ulna. The antebrachiocarpal joint is the most frequently aspirated of the carpal joints. The carpus should be flexed to 90°. A depression, corresponding to the antebrachiocarpal joint space, is palpable just distal to the radius. Insert the needle medial to the common digital extensor tendon and cephalic vein, which pass over the center of the dorsal joint space. Avoid the extensor carpi radialis tendon, which passes more medially. Arthrocentesis of the midcarpal and carpometacarpal joints can be performed by flexing the carpus maximally and palpating the space between the second and third carpal bones dorsally, which is the site for needle insertion. The intercarpal and carpometacarpal joints communicate with each other, but not with the antebrachiocarpal joint. Arthrocentesis of the metacarpo(tarso)phalangeal joints is extremely difficult if they are normal. 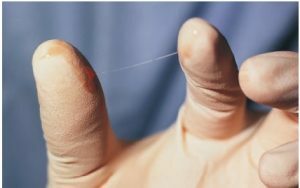 However, placement of the needle on the dorsal aspect to the side of the digital extensor tendon, with the joint maximally flexed, will facilitate arthrocentesis of diseased joints. It is prudent to use a slightly smaller needle (21 gauge, 16 mm) in all patients. The stifle should be positioned in slight flexion–extension, with slight external rotation of the limb. Palpate the tibia tuberosity, patella and straight patellar ligament, and insert the needle lateral to the straight patellar ligament, midway between the two bony landmarks, angling the needle proximally at 45° to the skin. After insertion through the skin, lower the needle and syringe parallel to the straight patellar ligament so that the tip of the needle is positioned lateral to the patella in the lateral parapatellar joint pouch. Others have suggested to angle the needle toward the center of the joint. The needle should aim toward the intercondylar notch. Keeping mind there is a fat pad present that may interfere with obtaining fluid. If fluid is not obtained initially, back the needle up, redirect, and aspirate. It may be helpful to apply digital pressure to the opposite side of the patellar ligament to cause joint fluid to collect toward your approach. The talocrural joint space is most easily aspirated. Flex and extend the talocrural joint to identify the position of the joint. With the joint in a neutral position, insert the needle on the dorsolateral aspect, just medial to the palpable lateral malleolus of the fibula, in a plantaromedial direction. Applying digital pressure to the plantaromedial and plantarolateral aspects of the joint may help to displace synovial fluid into the dorsal joint pouches, making a positive arthrocentesis more likely. Alternatively, the plantarolateral joint space of the hock may be aspirated by placing the needle parallel to the calcaneus, just medial to the lateral malleolus. Arthrocentesis of the proximal and distal intertarsal joint spaces and the tarsometatarsal joint space is rarely required, but can be achieved by palpation of bony landmarks dorsally and dorsal needle placement. If blood contamination is present, the blood will not mix with the joint fluid, but rather form streaks, whereas blood from ongoing hemorrhage into the joint appears evenly distributed. The protein content of joint fluid should be less than 3g/dL and the pH varies between 7 and 7.8. The total nucleated cell count within joint fluid should be less than 3000 cells/mm3. Polymorphonuclear cells should represent less than 10% of the total cell population. Changes in color, volume, viscosity, cell count or biochemical parameters may represent pathological conditions, such as septic arthritis, immune-mediated arthropathies, neoplasia or others. To establish whether septic arthritis is suspected, joint fluid should be cultured (submit in plain vials, on culture swabs or blood culture bottles). 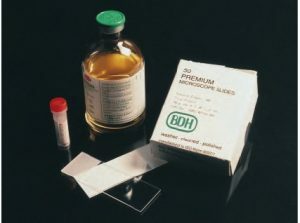 The use of blood culture media is recommended particularly in cases where slowly growing organisms are expected or empirical antibiotic therapy was performed prior to the joint tap. A negative blood culture does not completely rule out a septic arthritis. To avoid growth of contaminants, joint fluid needs to be introduced in a sterile manner as follows: After obtaining joint fluid, change the needle on the syringe to a new sterile needle. Clean the top of the blood culture bottle with plenty alcohol with or without sterile swabs. Introduce the needle into the rubber top of the blood culture bottle. There is usually a negative pressure in the blood culture bottle that will draw the sample into the liquid. Store the bottle away from sunlight at room temperature or in the fridge and ship to the lab as soon as possible. Arthrocentesis is a simple diagnostic procedure that is associated with minimal morbidity. Synovial fluid assessment can be readily performed and the results rapidly interpreted in practice; It requires little expertise or equipment, and should be carried out whenever joint disease is suspected.